Rejoice, tweeters! You now have more characters with which to craft the perfect reply. 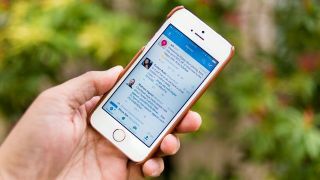 Twitter has announced that it will no longer count @usernames against your 140-character limit in replies, meaning you can respond to as many people as you like without their handles muscling in on actual tweet text territory. The change, rolling out to the twitter.com and Twitter's iOS and Android apps today, introduces a new way to see who you are replying to. Now, when you go to write a response, you'll see who you are @'ing above the tweet text versus in the tweet itself. To see who's part of your conversation, tap "Replying to..." and the accounts will appear in a drop down menu. You can also remove users from the conversation here, including blocked accounts. To remove someone you've blocked, click on the green checkmark icon next to their name. To remove any user – save for the author of the original tweet you're responding to – also click the checkmark, and they will be removed. One exception to the new rule is adding people. You can only add another account manually, and this will count against the 140-character limit. Finally, the change means that for any conversation with users replying, you won't see usernames spelled out at the start of a tweet, but rather only what's being said between participants. Twitter says it saw an increase in conversation engagement during tests of the feature, and while it does give users more characters to worth with, we'll see if the new protocol catches on. Yes, you have more characters at your fingertips to state your case/perfect a punchline/not have to save space by writing "u" and "b", but you also have to take an extra step to see who is part of a conversation. This could be a turnoff or unwanted complication for some. On the flip side, as Twitter looks to sunset some of the quirky rules that have turned users away, this could be just the trick to help old and new users participate without feeling like they're censoring themselves. That feeling, we can say from experience, is frustrating, to say the least.